An invitation to the president of Ghana to address MSPs undermines the safety of the Scottish parliament for members of the lesbian, gay, bisexual and transgender (LGBT) community, according to opposition MSPs. The MSPs are joining with human rights campaigners to call on the Scottish government to confront President John Dramani Mahama about his country’s abuses of its lesbian and gay citizens. 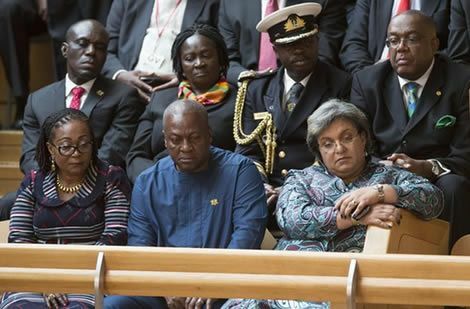 Mahama received muted applause from the Holyrood chamber as he listened to FMQs on Thursday morning, but a meeting with opposition leaders was cancelled. After the Scottish parliament’s presiding officer, Tricia Marwick, said she would “extend the hand of friendship” to Mahama, members of the Scottish Greens, including their co-convenor Patrick Harvie, who is gay, wrote to her on Wednesday to urge caution. Ghana is one of 75 countries around the world where it is still illegal to be gay, carrying a sentence of up to three years in prison. While the director of Stonewall Scotland, Colin Macfarlane, acknowledged “some promising statements from President Mahama criticising violence against LGBT communities”, he went on to call for the Scottish government to recognise its “important responsibility to help advance the protection of LGBT rights across the world”. Responding to calls from opposition leaders, a Scottish government spokesperson confirmed that the first minister would “share her strong view that the Commonwealth values of humanity, equality and tolerance are universal values” during the president’s visit. Naomi McAuliffe, Amnesty International’s programme director inScotland, said her organisation received regular reports that LGBT people faced police harassment, while repressive attitudes towards LGBT Ghanaians meant they were vulnerable to discrimination and physical attacks. This was against a background of the use of torture and ill-treatment by police and intelligence services, alongside widespread violence against women and girls. Mahama’s visit to Scotland will also entail him receiving an honorary degree from the University of Aberdeen on Friday.